The 1932 Ford: As Many Ball Bearings As Cars Costing Four Times As Much! 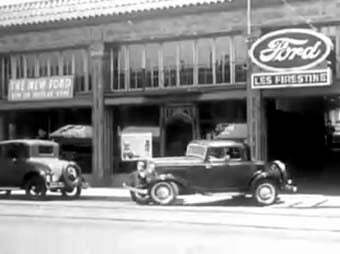 Les Firestine Ford disappeared from Oakland's Auto Row many decades ago, but this promo film- apparently shown in theaters around the East Bay- makes the Deuce Coupe seem like a pretty good deal, even now. Watch as that Model B flies up Fish Ranch Road (which looks exactly the same today) in top gear, and check out that cool tracking shot through the dealership- why, you can even catch a glimpse of the closer sweating a customer into signing on the line that is dotted! Thanks to Maxichamp for the tip!